A short sale is the sale of a property for less than what the borrower owes to the lender. A short sale is an alternative to foreclosure when a homeowner wnats to sell and can no longer afford to make mortgage payments. The lender agrees to accept less than the amount owed to pay off a loan now rather than taking the property back by foreclosure and trying to sell it later. Lenders agree to a short sale because they believe it will net them more money than going forward with a lengthy and costly foreclosure process. No. 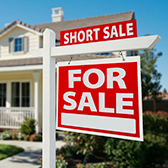 A short sale is a very complicated real estate transaction and one that has very important implications for you. More than any other type of residential real estate transaction, a short sale should be handled only by a real estate broker who has substantial experience with the short sale process, and a strong track-record of success in obtaining approvals of short sales for their clients. While doing a short sale will negatively affect your credit, there are many benefits to choosing a short sale over foreclosure. With a short sale, you are in control of the sale, not the bank. You can spare yourself the social stigma of foreclosure. Every homeowner's situation is different, so we always recommend that you speak with a real estate attorney that can advise you on the legal and tax implications for your circumstances. If you owe more than your house is worth and can't afford your mortgage payments, you may qualify for a short sale. Every situation is unique, but in general the basic criteria for qualifying for a short sale are: • You want to sell your home. • You owe more on your mortgage than your home is worth. Unless specifically authorized through a federally-sanctioned program such as HAFA, when a lender approves a short sale, they typically require that the borrower (seller) not receive any money from the sale of the property since the lender is going to take a loss on the loan. Sometimes the lender offers a small relocation assistance payment. Maybe, maybe not. Just starting a short sale will not automatically stop a foreclosure. However, many times a lender can be convinced to postpone the foreclosure to let a short sale negotiation take place. If you are facing a foreclosure sale date and would prefer to sell your house on your own, it is worth a try. No, there is no guarantee that this will work. Once you fall behind on your loan, the lender can proceed to foreclosure. But typically, lenders prefer not to foreclose and, if effectively presented with smart alternatives, they will often agree to a short sale rather than foreclose. If a short sale is attempted but doesn't work, your house will likely go to foreclosure.